Although the current Ford F-150 was introduced for 2015 while the current Super Duty lineup was all-new in 2017, the Motor Company is already hard at work on new versions of their entire F-Series lineup – and we will see all of these new trucks by 2020. The Ford F-Series has been the bestselling truck in America for more than 40 years while serving as the bestselling overall vehicle for 36 years. One of the ways that the Motor Company keeps their trucks atop the sales charts is by keeping them fresh, and although the current F-150, F-250 and F-350 are all fairly new, the automaker will unveil new versions of all of these trucks within the next two years. Ford F-Series sales are all lumped into one big number, so the exact sales figures for the F-150 from year to year aren’t broken out from the other models, but we know that the F-150 is the bestselling F-Series truck. 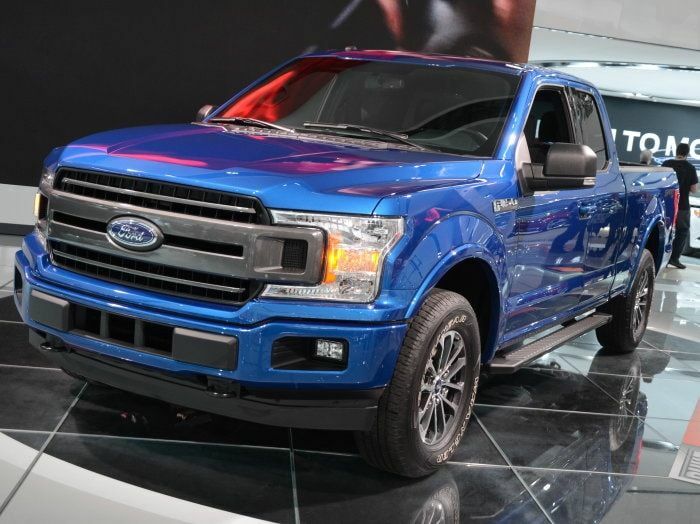 F-150 sales have been strong since the current generation was introduced for the 2015 model year, even though many people questioned Ford’s shift to a body that is comprised heavily of aluminum. As we near four years of sales for the aluminum F-150, owner reports remain positive and the sales figures keep growing, so the shift away from steel definitely hasn’t hurt half-ton sales for Ford. With the current F-150 being introduced back in 2014 for the 2015 model year, and a facelift bringing a new look up front and out back for the 2018 models, some people might be surprised that Ford is already working on another new F-150, but it makes sense. The 12th generation of the F-150 ran from 2009 through 2014 (6 model years), the 11th generation ran from 2004 through 2008 (5 model years), the 10th generation ran for 7 model years, the 9th generation lasted 6 model years and the 8th generation – back in 1987 through 1991 – lasted 5 model years. In other words, based on the history of the model over the past 30 years, each generation of the F-150 has run for 5 to 7 years. Come 2019, the current F-150 will have been available for 5 model years, so while a new model for 2020 seems early based on the success of the truck, it falls within the normal range of time for an F-150 generation. While the timing of a new Ford F-150 in 2020 falls within the average length of time, the new Super Duty expected to arrive for 2019 comes as more of a surprise. The current Super Duty models like the F-250 and F-350 were all-new for the 2016 model year, so if the company plans to reveal a new version in 2019, the current generation will have only run for 2 model years. That seems highly unlikely, considering that the past two generations of the Super Duty have each lasted 9 model years. What seems more likely is that Ford will introduce a facelifted F-250 and F-350 in 2019 for the 2020 model year. The company made a similar move during the previous generation, introducing an all-new Super Duty in 2008, only to bring out a refreshed model in 2011. If the new truck is to be shown off in 2019 for the 2020 model year, then the current version will have run for 3 model years before a refresh – just like the previous generation. In any case, the Ford F-150, F-250 and F-350 should all be getting some significant upgrades over the course of the next two years which may or may not entail all-new trucks. I used to drive Chevrolets, but somehow purchaed a 2011 F150 XLT 4x4, it was a great truck. In 2015 I traded it in and purchased a 2015 F150 Lariat. It is the best truck I have ever owned. Am looking to puchase a 2019 or 2020, whenever the 'new look' in design occurs. Keep up your great work. I traded a Chevy for the 2015 F150 Platinum and its the best truck Ive ever owned. I will trade it for the 2020 new design and likely wont even look at another vehicle. I brought the 2015 F-150 Lariat with the old reliable V-8 and then I traded it in for a GMC Sierra Denali. Let me say I was mostly disappointed. My Lariat had way more practical features and bells and whistles in it than the Sierra Denali. I kept the Denali for a month and traded it in for 2017 F-150 Limited. Let me say I was not disappointed at all and plan on keeping this truck until i retire or the new model is waaayyy better. I am 68, a retired farmer. I have owned an equal (and good) number of Chevy and GMC and Ford pickups over my lifetime. In the "mid" years, I preferred the GM truck. Now, it is Ford all the way. My 2015 F150 is just an amazing truck. Over 70,000 miles, now, there just hasn't been any way to fault it. The quality is impeccable, The performance perfect. The features completely awesome. You are so lucky in the US, the last official factory F truck sold in Australia was more than 13 years ago but they are so loved that if you've kept yours in good overall condition and serviced you can still get about 75% of its original sale price. The other day l looked at a duelcab diesel 2005 model with about 100,000 miles on it in like new condition and it was about $US30, 000. A brand new F150, GMC, Ram imported and converted to RHD will set you back about $US100,000.